Jazz and Louis Armstrong are synonymous. 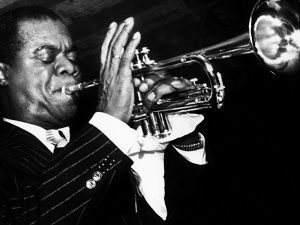 Armstrong, who was born at the start of the 20th century, came from very humble beginnings, but he was such an extraordinarily brilliant trumpet player, that he became a worldwide legend. He has starred in over thirty movies, and has gone down in history as playing a major role in introducing a fabulous new jazz sound to the world at large. His magnificent unique style and boundless energy along with his musical innovation and improvisation, have had a huge effect on generations of jazz players and everyone who loves all the wonderful things that jazz offers. When Armstrong was a young boy, he used to sing on the sidewalks with a group of friends. One day, he was able to buy himself a second hand brass cornet, and practised playing it without any guidence. By the time he was 11 years old, he stopped school so that he could work to help provide for his family. When he played music on the side walks, he came to the attention of musicians from the local neighbourhood, and on one occasion he made friends with a man named Buck Johnson, a very well known trumpet player from the area. Johnson took Armstrong under his wings; he let him watch his honky-tonk gigs, showed him special musical techniques, and taught him various songs. After developing his own style, and gaining experience in different bands, in 1918, Armstrong became a popular figure on the music scene in New Orleans, where he played at numerous venues. He then went on to spend three years , playing on riverboats. After this, he returned to New Orleans, and then joined a Creole Jazz Band in Chicago. Here he met Lil, his second wife, a jazz pianist with classical training. She saw her husband’s boundless potential, and helped him make it to the top. And the rest, as they say, is history! Read his biography here.